After 2009’s 3-night sell out, this wond Gerald Dickens performs the classic tale ‘ A Christmas Carol, Charles Dickens famously deliverederful story from the same stage, so what better way to celebrate 200 years of this amazing writer than to go back in time and re live the experience with Mr Dickens himself. 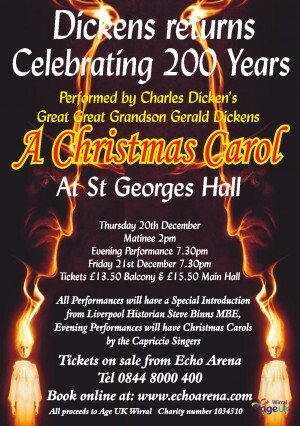 The show will be opened by Liverpool’s Historian Steve Binns MBE who will share his vast knowledge of Charles Dickens he will regale you with tales of Dickens time in Liverpool and pique your interest with the unknown side of this fascinating man. The Capriccio Choir will present a selection of Christmas Carols during both evening performances.